Neon again, but a much better DVD this time! 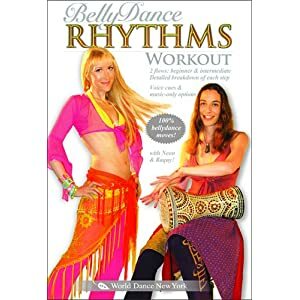 This is a combination of drum solo drills and belly dance fitness workout, and it works surprisingly well. There are 40 - yes 40 - different drum solo combos. The DVD is split into two levels, beginners and intermediate, and there are also detailed, well explained tutorials for those who need them. Raquy, the drummer, does a good job of explaining the rhythms (without going into cultural background) - so this is an excellent DVD for those struggling to understand the difference between the basic rhythms of chiftitelli, beledi, saiidi, maksoum and masmoudi. By the time you've listened to the explanations and practiced the drills, those beats will be well and truly in your head! The intermediate level is a good workout for more advanced dancers, though you may need to link some of the combinations together to get a worthwhile drill.